Register a new recognition code when replacing the door control transmitter or the door control receiver. Add mode is used to retain the already registered codes while registering a new recognition code. This mode is used when adding a transmitter. Rewrite mode is used to clear all the previously registered codes and register only new recognition codes. This mode is used when exchanging the transmitter or the door control receiver for new one. Confirmation mode is used to confirm how many recognition codes have already been registered before an additional registration of a recognition code. Prohibition mode is used to clear all the registered codes and cancel the wireless door lock function. Use this mode when the transmitter is lost. All of the steps in the following registration procedure must be performed in sequential order continuously. (a) The following conditions should be met. (1) No key is inserted in the ignition key cylinder. (2) Only driver side door is opened. (b) Perform the following operations to select the desired mode. Then insert the key into the ignition key cylinder and remove it. Complete this procedure within 40 seconds. Then insert the key into the ignition key cylinder and close the all door. (4) Turn the ignition switch from LOCK to ON and back to LOCK at approximately 1-second intervals 1 to 5 times to select a mode (see the illustration). Then remove the key from the ignition key cylinder. 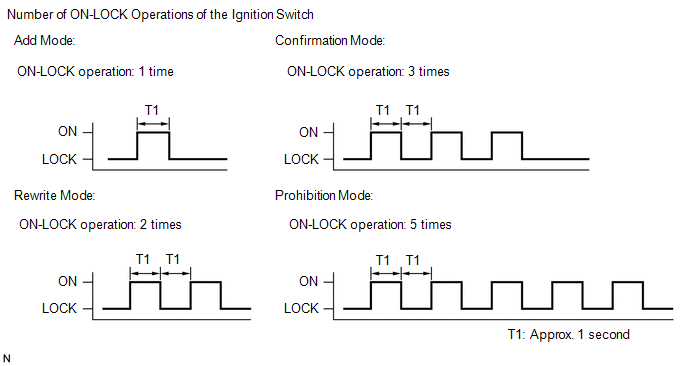 If the number of the ON-LOCK operations of the ignition switch is 0, 4, 6 or more, there will be no response to inform which mode has been selected. (5) After selecting a mode, the main body ECU (driver side junction block assembly) automatically performs the power door LOCK- UNLOCK operation within 5 seconds to inform the selected mode (see the illustration). In confirmation mode, the LOCK- UNLOCK operation will occur once for each recognition code that has been registered. 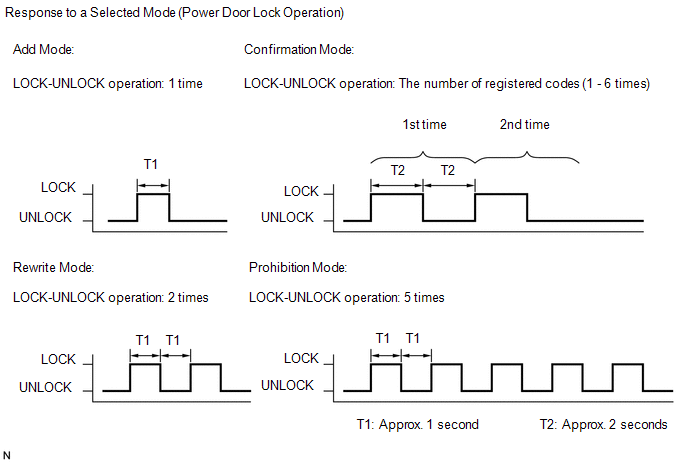 For example, if 2 recognition codes have been registered, the LOCK-UNLOCK operation will occur 2 times. In confirmation mode and prohibition mode, once a LOCK-UNLOCK operation response has occurred, the registration procedure will end. (1) Within 45 seconds after add mode or rewrite mode has been selected, press the LOCK and UNLOCK switches on the transmitter switch simultaneously for 1.0 to 1.5 seconds. (2) Within 5 seconds after the transmitter switch has been released, the LOCK-UNLOCK operation will be automatically performed once if the registration of the recognition code of the transmitter is completed correctly. (3) If multiple transmitters need to be registered, repeat procedures "A" and "B" within 45 seconds each. Up to the maximum registration number can be registered at once. If even one of the following conditions is met, registration mode will end. 40 seconds have elapsed after a recognition code has been registered. Any of the doors are opened. (b) Select either add or rewrite mode according to the Techstream display. (c) The number of registered codes is indicated. (d) Registration of the door control transmitter. (1) If either add mode or rewrite mode has been selected, press the LOCK and UNLOCK switches on the transmitter simultaneously. (2) Within 3 seconds of releasing the LOCK and UNLOCK switches, press either of the switches on the door control transmitter. Do not press the LOCK and UNLOCK switches simultaneously for more than 1.5 seconds. Perform this operation within 1 meter of the driver seat to register the transmitter. Do not push other transmitter switches during the transmitter registration process. (3) The main body ECU (driver side junction block assembly) automatically performs the power door LOCK-UNLOCK operation once in order to indicate whether registration has been completed correctly or not. (4) If continuing registration, the next recognition code must be registered in the door control transmitter within 30 seconds. Up to 6 recognition codes can be registered. (e) Completing the registration mode. 30 seconds or more have elapsed after a code is registered. The Techstream is used to finish registration. (f) Perform the following after registration is completed. (1) Perform the wireless door lock control operation check (See page ). If the wireless door lock control does not operate, perform the registration procedure again.